Q: How do you screw up a great idea like a Build-A-Batsignal? A: By shortpacking almost every character who isn't Batman. Mattel's Dark Knight Rises Movie Masters line has been a serious pain to collect: while you can almost assuredly still pick up the heavily packed, 100% re-release Batman, and Bane isn't particularly difficult to locate, the other four figures in the series might as well be figments of Mattel's imagination. Initial casepacks varied heavily, and while some included one Catwoman and one Alfred among the Batmen and Banes, others only included one Alfred, and still other cases featured nothing but Batman and Bane. The final two figures in the set have yet to hit brick and mortar stores with any real force, and the best way to find them is to keep reloading your favorite e-tailer's website so as not to miss when they sporadically become available. Your other option is to pay the obscene secondary market prices that sellers are asking for them. It's not particularly fun to collect this line, is what we're saying. The final figure in the line was kept a secret right up until he was actually released, although we use the term "released" loosely since he still has yet to show up anywhere in serious numbers. But he is out there. 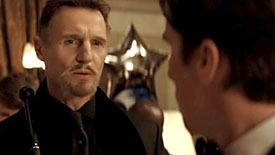 While the "secret" angle was being played up, pretty much every single person guessed it would be Ra's Al Ghul. And while that ended up being right, everyone was also kinda wrong: see, we all assumed the figure was being kept secret to avoid spoiling a possible appearance by Ra's in The Dark Knight Rises. 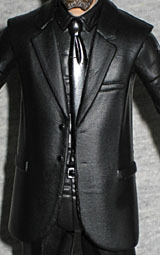 However, the figure Mattel released is quite obviously based on his appearance in Batman Begins. So why all the secrecy? Well, it's Mattel. They're not exactly known for their decision-making skills. So, Ra's Al-Ghul. The figure is based on Ra's's's's (re)appearance near the climax of Begins, because that allowed Matty to utilize their favorite re-use body: the suit. As far as Mattel is concerned, your average bank robber wears the same style of suit as the District Attorney, who also shares the same tastes as a billionaire's butler and the leader of an organization of shadowy ninja assassins. 99% of this figure is the basic Matty suit sculpt, which we've reviewed back when it was Harvey Dent. This time, it's done all in black, because Ra's is just that kinda guy and Mattel doesn't like to paint things when they don't have to. The new bits are the head and the hands. The head is a decent visage of Liam Neeson with his funky Van Dyke beard, but for some reason his lips are slightly parted, giving him a somewhat goofy expression. He looks less like the ruthless leader of the League of Shadows and more like he's playing Lenny in the local community theater production of Of Mice and Men. His hands have these funky black gloves, with little holes that let the knuckles poke out. He was wearing them at this point in the movie, so okay. The only paint apps to be found are on the gloves, head and neck. The skintone is decent, but gets a bit goopy on the gloves. His brown hair gets a little bit of gray frosting to indicate his age. Ra's gets one accessory in addition to his piece of the Batsignal: his gasmask. It fits over his head and, strangely, goes around his ears instead of over them (it's designed this way, with the strap flaring out near the ears - it's how he wore it in the film). He gets no weapons, which isn't surprising in the Movie Masters line. It still would have been more logical if he came with his sword cane. Or even just his cane. 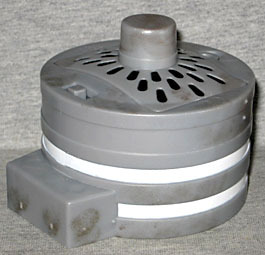 His BAF piece is the last piece of the Signal; it's the cap that fits on the back of the signal proper, and includes the light source and the battery housing. Yes, housing - batteries not included. This is also the only set to include instructions on how to assemble the signal (not that you can't figure it out, we're just saying). I can't kid myself that Ra's is a great figure. He's almost entirely a repaint, and the head definitely leaves something to be desired. However, as the main villain from the first Christopher Nolan Batman film that features a key piece of the Batsignal, he's an essential figure in more ways than one. It's a shame that it's such a pain to get him.